If you do an analysis of my work day, you would see something different everyday. My job may include meeting with staff to discuss an observation or evaluation, meeting with parents to discuss a concern or create a plan, working with students or addressing any of the other myriad of items that come across my desk: answering emails, balancing building budgets, ordering instructional supplies, developing professional development activities, hiring staff, completing state reports, monitoring lunch time, visiting classrooms, greeting students at the door, dropping handwritten notes, recognizing positive behavior, and so much more. So I get asked at times how I have the time to blog and tweet. The answer is simple. We all have the same amount of time in the day. 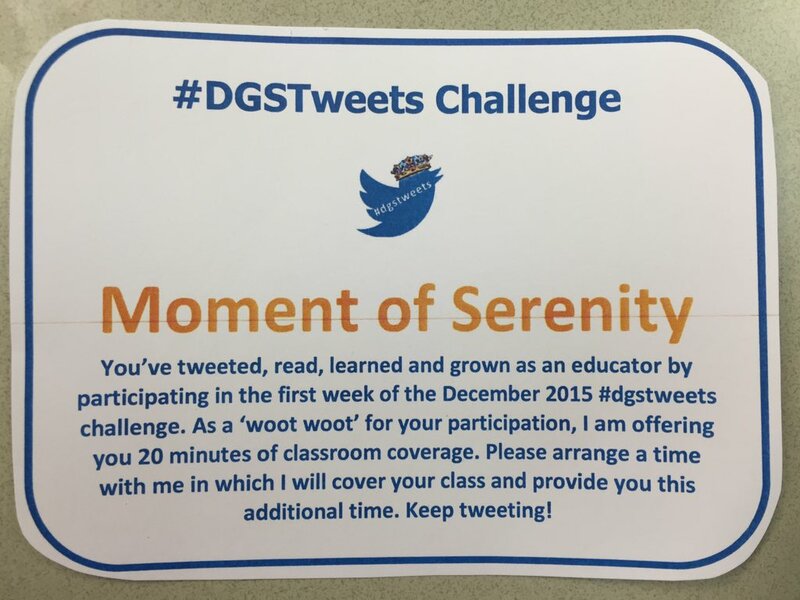 I choose to make time for these meaningful practices. My blog is an outlet for me to reflect on best practices and share my experiences, ideas, resources, and thoughts with other like minded professionals. It is part of being a connected educator. In addition, my blog models reflective learning with my staff and shows that I value reflection and sharing of educational practices. During a recent Danielson flavored evaluation training, our presenter focused on the key elements that make a great teacher. Whereas 3C (engaging students in learning) was the most important in his presentation, he stressed that excellent teachers also grow professionally and share their learning and expertise with others. Why would I expect that from my staff, if I am not willing to walk the walk and talk the talk? So, I make the time to blog. I share my blog posts with my staff and in many cases with our students’ families and with the greater community. It creates a ripple effect. 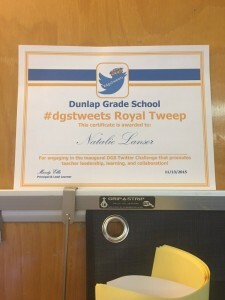 A principal I have connected with on Twitter challenged principals to share their practices that create ripple effects of learning. Beth Houf encouraged school leaders to create a twitter challenge, tweet or post the wonderful things occurring in their buildings, and overall enthusiastically share the awesomeness occurring in our buildings. You can read her initial post here. 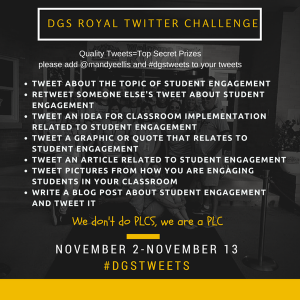 I’ve taken the inspiration I’ve seen from connecting to other principals to create staff twitter challenges. 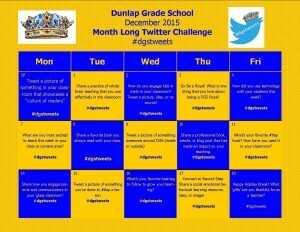 In the month of December, staff have a calendar to challenge themselves to tweet and share resources, ideas, and celebrations from their classroom. 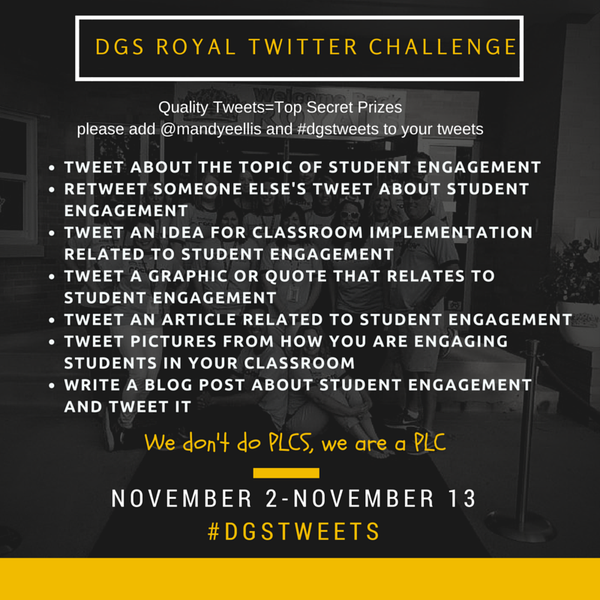 The inaugural twitter challenge was focused on student engagement and encouraged staff to tweet, retweet, and post articles, pictures, and items related to student engagement. 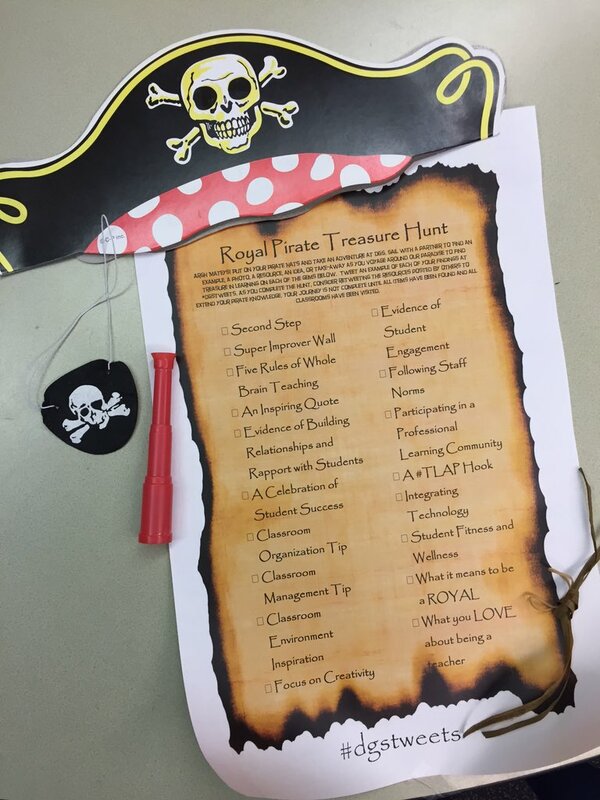 In addition to self-paced and individualized twitter challenges created for staff, our most recent staff meeting was a collaborative team twitter treasure hunt. Staff was asked to go throughout the building searching for examples and models of key artifacts that support school goals and professional learning. 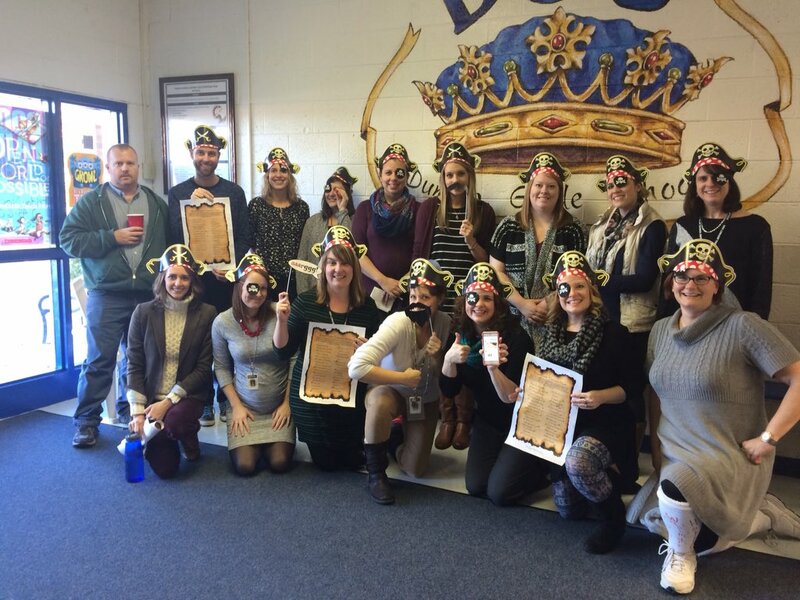 Staff worked with partners to find examples of a culture of readers, student engagement, celebrating student success, fostering physical fitness, and more. 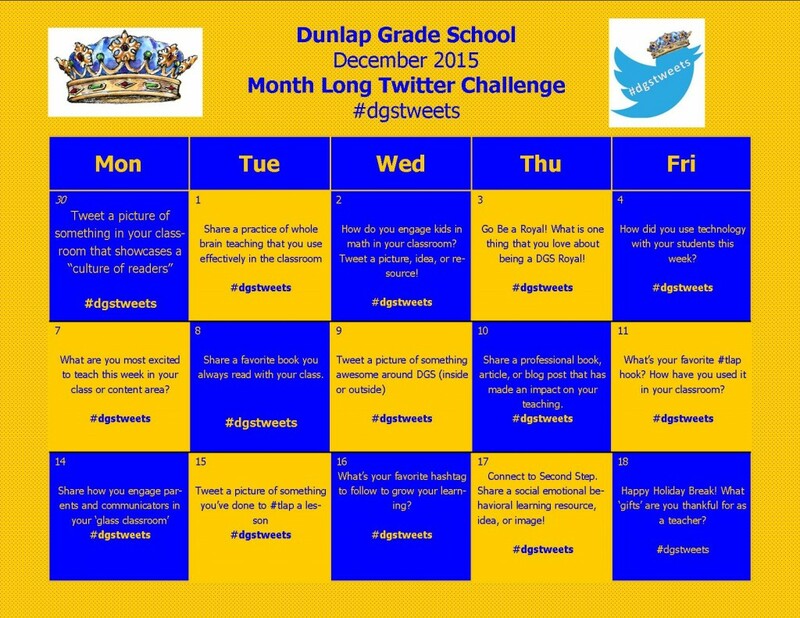 As teachers found this evidence and took pictures, they shared them on twitter at #dgstweets. Following the twitter treasure challenge, staff assembled to debrief, view the tweets, and discuss their takeaways. 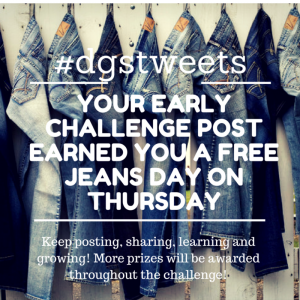 As incentive to grow professionally by completing these challenges, staff are given surprise incentives that are either inexpensive or free. 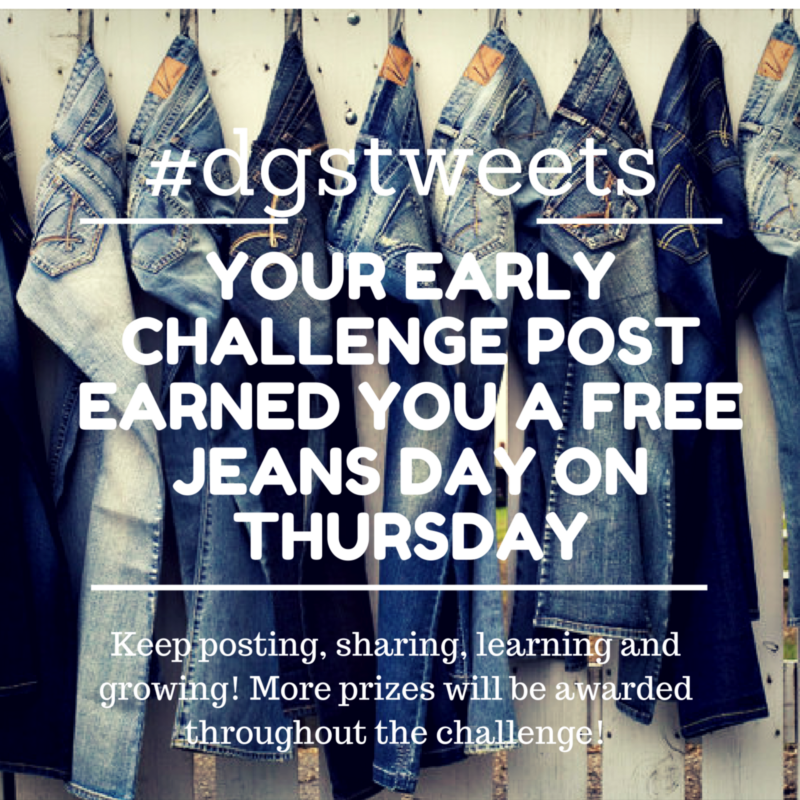 They range from a casual day, to coverage for their classrooms, to candy or a certificate of participation. I’ve included these below along with access to editable word documents that can be customized. So what has come out of all of this? 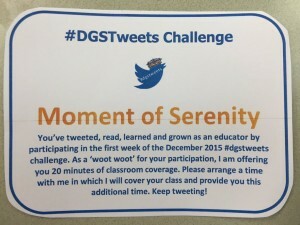 It has created a culture of positive personal professional learning in which teachers access twitter and/or blogs to seek to connect and learn with other educators and professionals. Teachers share their ideas with each other as well as staff in other buildings in our district and districts across the nation. Teachers connect with parents, promote a positive culture, and reflect on their instructional practices. It has taken away the concept that we work in isolation and fostered open and collaborative learning amongst the staff. It has provided me an outlet to provide feedback and be present in the classroom during times I can’t physically be there. As an instructional leader and coach, I have gained a stronger understanding and insight into classroom instruction. 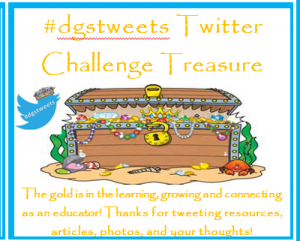 In some cases, it has created a ripple effect in which parents have created twitter accounts to follow classroom learning.